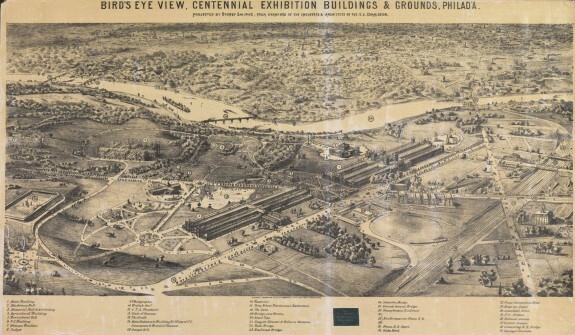 This bird’s-eye view of the Centennial grounds includes thirty-nine buildings as well as many outside sites, including the Falls, Columbia, and Girard Avenue bridges over the Schuylkill; the “new Bridges over Penna. R.R;” Elm, Belmont, and Girard Avenuess; the Twenty-Fourth Ward reservoir; George’s Hill and Belmont Mansion; the Globe and Continental hotels; and East Fairmount Park. The Centennial opening included musical entertainment as well as speeches by local and international celebrities. 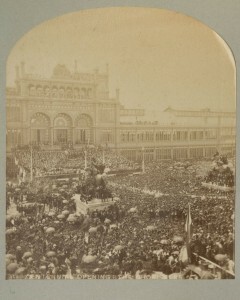 They attracted huge crowds to the specially erected platform in the plaza directly in front of the main Exhibition Hall, as did the Fourth of July ceremonies at Independence Hall and closing ceremonies on the fair grounds in November. Many exhibitors, private and governmental, erected virtual buildings within the main exhibition hall. Furniture dealers, upholsterers, and decorators divided their spaces into rooms representing special spaces such as parlors, libraries, and dining rooms. 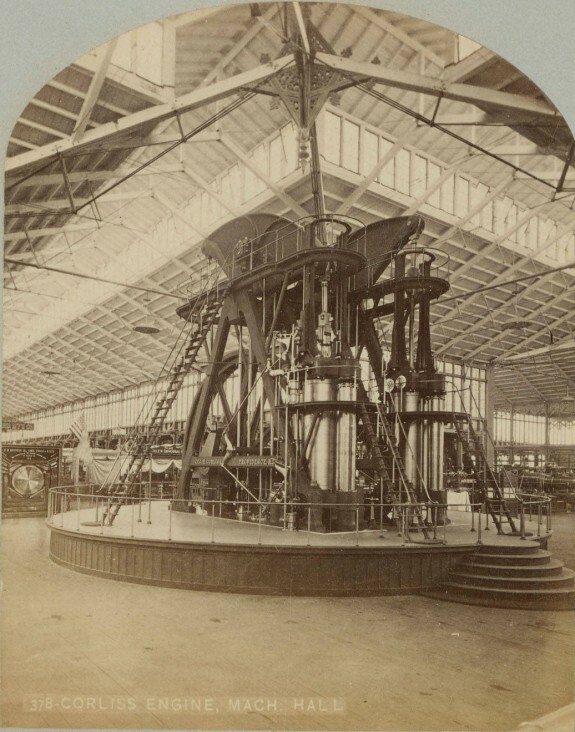 The Corliss Engine, the central exhibit in Machinery Hall, was connected by miles of shafts to huge boilers outside the building which operated machinery in other parts of the Fair. It was admired not only for its power, size and efficiency, but also as an object of aesthetic pleasure. The architecture of Memorial Hall was forward looking, anticipating the Beaux Arts style. It continued as the Museum of Art for Pennsylvania for several decades. Its dome can still be seen rising behind the Martin Luther King (West River) Drive along the Schuylkill River. The Centennial grounds were criss-crossed by seven miles of walkways, wide and narrow, heavily bordered with exotic and colorful plantings and passing by a man-made lake. There were several “total abstinence fountains” covered with statuary. Free-standing statues included the statue of William Penn that now stands atop City Hall and (shown here) the arm and torch of the Statue of Liberty. 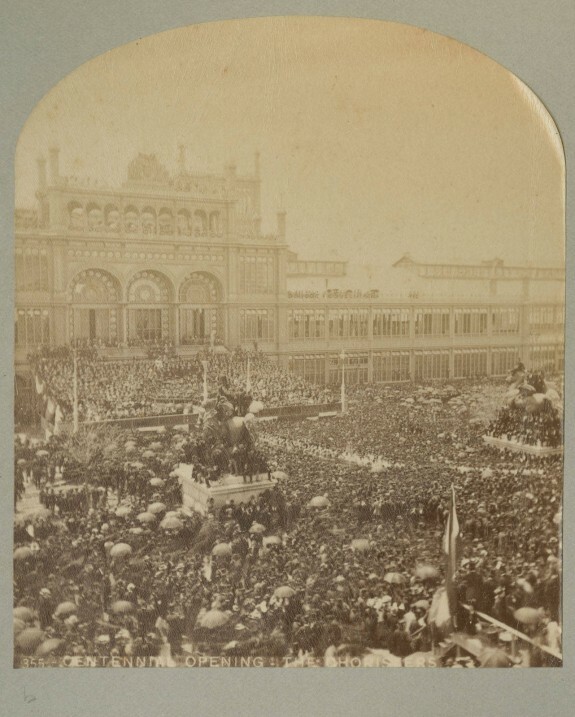 The International Exhibition of Arts, Manufactures and Products of the Soil and Mine, more simply known as “the Centennial,” opened in Fairmount Park to great fanfare on May 10, 1876, and closed with equal flourish six months later. 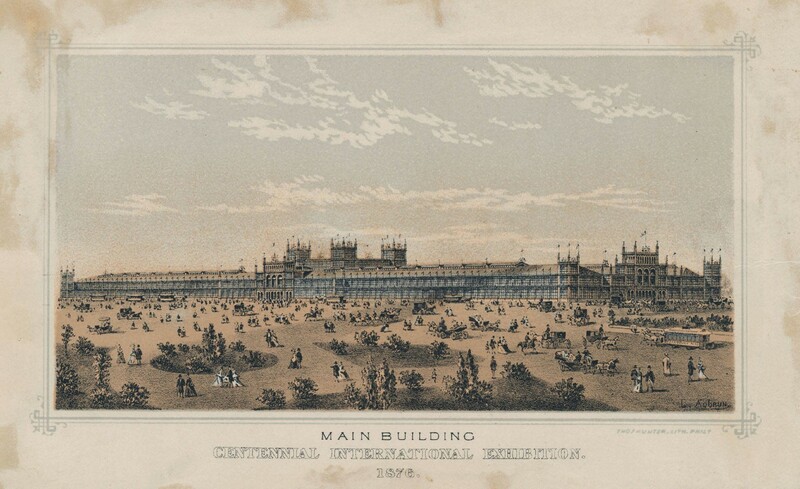 Modeled after the Crystal Palace Great Exhibition in London in 1851, and the first in a long line of major “world’s fairs” in the United States, the Centennial exhibited national pride and belief in the importance of education and progress through industrial innovation. An additional mission of the Centennial grew from a desire to forgive and forget the Civil War. The idea for presenting a World Exposition in Philadelphia honoring the hundredth anniversary of the Declaration of Independence was first presented to Mayor Morton McMichael (1807-79) in 1866 by Professor John Campbell of Wabash College, Indiana. 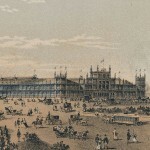 In 1871, with support from prominent businessmen such as John Wanamaker (1838-1922), the Republican political machine, and the Franklin Institute, the city and state successfully petitioned Congress to authorize the Centennial and set up a commission to oversee planning and implementation. The legislation explicitly excluded federal funding for the fair. The commissioners, led by Joseph R. Hawley from Connecticut as chairman and Alfred T. Goshorn from Ohio as director-general, were not political appointees but leaders in business. They were confident that the undertaking could be handled by private enterprise. Although rich in historic associations, Philadelphia also presented problems as a site for the fair. Business sponsors and nonprofit organizations quarreled over whether to focus on commercial achievements or on American progress in the arts and sciences. Outside Pennsylvania, some suspected that the Centennial was merely an attempt to promote Philadelphia and its industries, and the nationally publicized kidnapping of 4-year-old Charley Ross from Germantown in 1874 painted the Philadelphia police force as corrupt and incompetent, raising fears for the safety of visitors. The Panic of 1873 dried up private financing. Fair organizers devoted the next several years to attracting attention and money from national, state, and foreign governments; from organizations like churches and universities; and from industrial and commercial associations. They enlisted newspapers all over the country in the cause. Members of the Women’s Centennial Committee had the most success raising funds, going from door-to-door in thirty-one states, selling stock and bringing in $100,000 in contributions. Still, with insufficient capital on hand as the opening neared, and the prestige of the United States at stake, the federal government was forced to step up. The government required repayment as first creditor, thus dooming the fair corporation to financial failure. As a popular attraction, however, the Centennial was a great success. At a time when the population of the United States was 46 million, and that of Philadelphia less than one million, almost ten million paid admissions were recorded, with most people paying fifty cents to attend. While the majority of visitors were from Pennsylvania and its neighbors, 20,000 signed in from Illinois and more than 2,000 from California. On their special state days, Pennsylvania and New York each recorded over 250,000 attendees, while New Jersey, Delaware, and Maryland listed over 10,000 each. 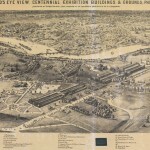 The Centennial overlooked the Schuylkill River, with 250 pavilions and seven miles of avenues and walkways occupying a 285-acre tract of Fairmount Park’s 3,160 acres. Many visitors arrived at the temporary “centennial station” of the Pennsylvania railroad and entered through the newly invented automatic turnstile. 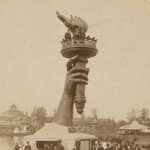 They found numerous fountains and statuary placed strategically throughout the grounds, prominent among them the arm and torch of the Statue of Liberty. Concessionaires, who paid up to 50 percent of their take for the privilege doing business within the fair, operated stands selling cigars, soda water, and popcorn, and theme-oriented restaurants, including French, Turkish, and Viennese. The Centennial Commission owned and managed thirty-four structures, including five central buildings that covered more than fifty acres. The largest, the Main Exhibition Hall, included exhibits on education and science but concentrated largely on the industrial arts and on selling merchandise. 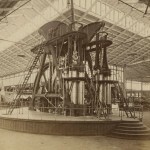 Machinery Hall housed the huge Corliss Engine, both the power source for the fair and perhaps its most popular attraction. Exhibitors demonstrated their processes of manufacturing while also offering their products for sale, increasing the interest of visitors. Agricultural Hall where the latest in farm equipment was demonstrated, along with forty-two acres of farm and livestock exhibits, was of particular significance for the still largely-agricultural nation. 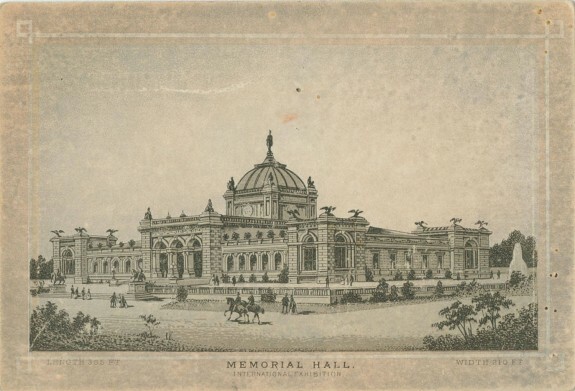 Horticultural Hall with its Victorian gardens and Memorial Hall with its exhibit of international fine arts were smallest of the main grouping. Other buildings run by the Commission included fire and police stations, a medical department, and seven “public comfort” stations. The remainder of the buildings, just over two hundred, represented several interests. The United States government contributed seven structures, including a main exhibit hall housing the Smithsonian collection, which later formed the nucleus of the Smithsonian Institution museum. Of the twenty-six states that erected buildings, most were either Pennsylvania’s neighbors or from the mid- or far West. Most of the South was still smarting from its loss of the Civil War and resented the request to spend money in the North which had caused so much loss and devastation to its own region. Only Mississippi participated from the deep South, frustrating the attempt of the Centennial Commission and the Federal government to present a picture of a country reunited. While thirty-eight foreign countries had a presence, only fifteen provided their own buildings. Forty buildings, the largest number, were either commercial enterprises like the Singer Sewing Machine Company or community service groups like the Bible Society. 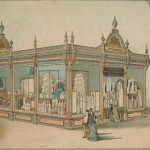 The Commission advertised the main value of the Fair as educational, urging visitors to compare the contemporary strides in technology and learning with the state of the country one hundred years earlier, but the growth of a consumer society made shopping one of the most popular activities. The fair also offered frequent entertainment by musical groups from symphony orchestras to minstrel bands, special days sponsored by states and nearby businesses, and events like hot-air balloon ascensions and fireworks displays. 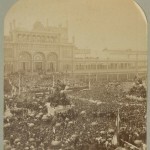 Huge crowds turned out for the music, speeches, and celebrations that marked the opening and closing of the fair and the Fourth of July. “Curiosities” such as a full-sized Liberty Bell made of soap, “Liberty accompanying Washington” done in human hair, and a Centennial medallion carved in butter attracted attention. Outside the gates, a small, temporary city grew up along what later became Parkside Avenue. Flimsy, wooden structures housed dubious hotels, low-end restaurants, ice cream saloons, beer gardens, and “shows,” and were sandwiched two or three deep on narrow lots. They stretched a mile in each direction from the main gate and provided entertainment the Commissioners deemed inappropriate on the grounds proper. Profits trumped morality, however, and when attendance flagged at the fair, the organizers allowed the sale of wine and beer. However, they resisted opening on Sundays, and amusement-park rides and “hoochie koochie dancers” had to await the Chicago Fair of 1893. Other values of the times were also on display, although not intentionally. Contempt and dislike of African Americans, laborers, and non-Anglo-Saxon foreigners often found expression in crude humor, such as exaggerated dialect, cartoons and stories found in books written about the Centennial. Victorian sensibilities demoted the graphic painting “The Gross Clinic” (1875) by Thomas Eakins (1844-1916) to the Army medical hall and banned all works by women from the Memorial Hall Art Exhibit. 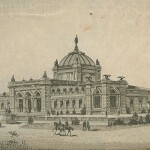 Two buildings were intended to be permanent, but Horticultural Hall was destroyed by a hurricane in 1954. Memorial Hall, although it ceased to be an art museum in 1928, continued to house the School of Industrial Arts until 1958. After that, it served as a gymnasium, swimming pool and police station. In 2008 it was renovated and reopened as the Please Touch Museum, a children’s museum that includes a “Centennial Exploration” exhibit featuring a tabletop diorama of the fair on a scale of 1:192 feet. 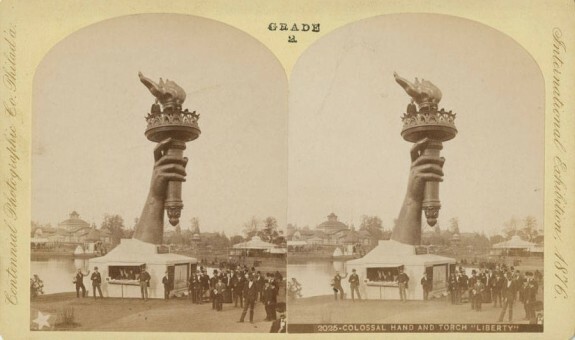 Commissioned in 1889 by John Baird, a former member of the Centennial Finance Committee, the model fulfills its intended mission of educating future generations about the Centennial Exhibition of 1876. Stephanie Grauman Wolf is a senior fellow at the McNeil Center for Early American Studies, University of Pennsylvania. Beers, Dorothy Gondos. “The Centennial City, 1865-1876.” In Philadelphia: A 300-Year History, ed. Russell Weigley. New York: W.W. Norton & Company, 1982. 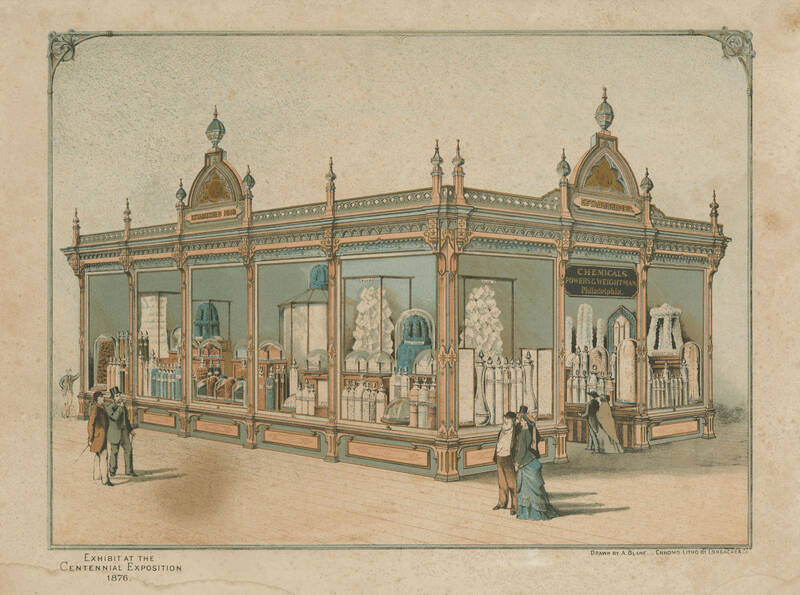 Gross, Linda P. and Theresa R. Snyder, Philadelphia’s 1876 Centennial Exhibition. Mount Pleasant, S.C.: Arcadia Publishing, 2005. Maass, John. The Glorious Enterprise: The Centennial Exhibition of 1876 and H.J. Schwarzmann, Architect-in Chief. New York: American Life Foundation, 1973. Rydell, Robert W. All the World’s a Fair: Visions of Empire at American International Expositions, 1876-1916. Chapter 1, “The Centennial Exhibition, Philadelphia, 1876: The Exposition as a “Moral Influence.” Chicago: University of Chicago Press, 1984. Centennial Ephemera Collection, Library Company of Philadelphia, 1314 Locust Street, Philadelphia. Centennial Exhibition Collection, Historical Society of Pennsylvania, 1300 Locust Street, Philadelphia. Centennial Exhibition Collection, Joseph R. Downs Collection of Manuscripts and Printed Ephemera, Winterthur Library, 5105 Kennett Pike, Wilmington, Del. Centennial Holdings List and Digital Collections, Free Library of Philadelphia, 1901 Vine Street, Philadelphia. Linfoot Collection, Athenaeum of Philadelphia, 219 S. Sixth Street, Philadelphia. 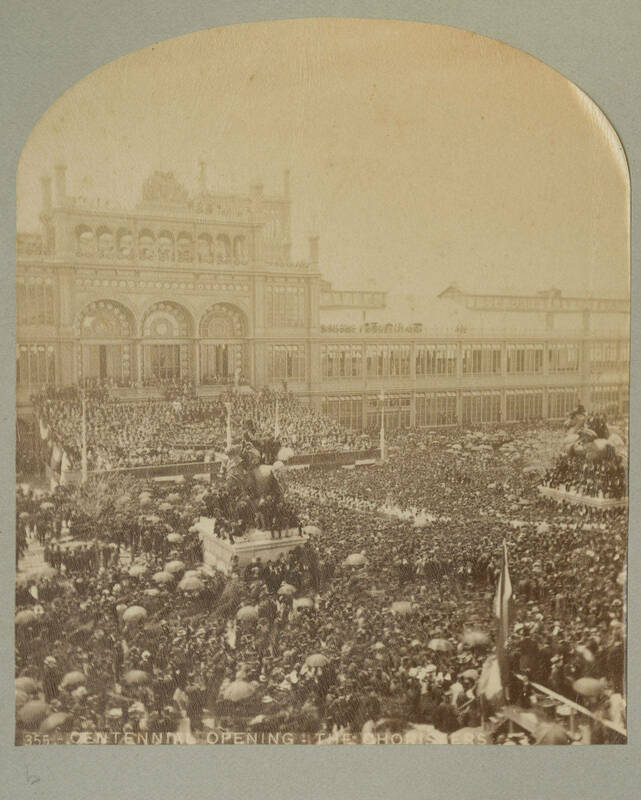 United States Centennial Commission – International Exhibition of 1876, City of Philadelphia Department of Records, City Archives, 3101 Market Street, Philadelphia. Please Touch Museum, Memorial Hall, Fairmount Park, 4231 Avenue of the Republic, Philadelphia. Thanks for this fine essay, Stephanie. The Centennial was certainly one of those quintessential events in Philadelphia’s history that distilled the hopes, dreams and self-awareness of Penn’s city. It was past, present and future all rolled into one. I have a small brick that I dug up in my backyard when I was a child. It is a souvenir from the 1876 centennial and was made from the Chambers Bros Archemedian brick machine. I wonder if it has any value. This is an amazing essay, including information that has never been available in one place before, to my knowledge. I grew up in one of the row houses built on Parkside Avenue after the original Centennial closed. In the 1950s one could still fill up bottles with fresh water from the spring, before it became polluted and was blocked (much of central and western Philadelphia is built over streams that still flow). I vividly remember the tragic loss of Horticultural Hall, although I remember it as burning down, not damaged by a hurricane (I’m sure I’m wrong–several other structures were lost to fire in the 1950s). My mother (Freda Anton) taught painting in Memorial Hall in the mid 1950s, amid lots of other community activities, while its amazing original statues and artifacts were hidden in its locked up main hall upstairs. A large Chinese Pagoda still existed then, and I found the giant painted wooden statues of gods, hidden inside dark areas, frightening, although the paths and bridge, similar to those of the Japanese Teahouse, were interesting. A lane of cherry trees nearby, given by an organization in Japan, still blooms today. Stone statues remain throughout the area, including the big one of Schubert in a glen. I have in my dining room what is known in our family as the bicentennial piece ordered by an uncle William King at the 1876 fair. His initials are carved on the front. I believe I once saw a similar piece on display at the Philadelphia Art Museum about 25 years ago. Are there any books featuring possible creators and values of these items? I have a old piano in my house that has lettering on the harp which has a award and medal of the expo of 1876 it’s made by the Albright company of Philadelphia and its serial # is 3009, could this possibly be one of the exhibits of the expo? How can I find out? I have a visitors “gate house” on my property from the fair. There is on near Independence Hall in Phila and at the Washington Street Mall in Cape May, NJ. We are looking to have it appraised as part of our historic home’s appraisal (circa 1720). Any suggestions re: value? I believe he was living in Phily at the time. He later moved to Cincinnati Ohio. My great grand uncle, John Mulvany, exhibited art work (“Preliminary Trial of a Horse Thief”) at the Fair. Where can I learn how the selection process for exhibiting paintings was conducted? Hello! I am now studying the history of aluminum and has been intereeted in its first manuftureed produds in US.I would appreciate if you could tell following matter. I heard first aluminum pruduct was” Transit” shown in Philadelphia Expo. held in 1876. 1.What was its official product name . 2.Who manufactured ,and how and when was it manufactured(for ex.casting etc.)? Just a correction: women were not “banned” from the main art exhibit and in fact several famous women chose to exhibit there instead of in the Women’s Pavilion. I am not sure it is accurate to say that, “a patronizing attitude toward women also pervaded the Centennial.” I have read materials from the Centennial in archives across the country and that attitude was not to be found except in some newspaper reviews after the Centennial opened.Gillespie was generally well-respected and admired.